In the wine industry September always feels a little like the Oscars. This year has been no different, as three major wine awards and critics announced their results in short succession. We’re proud to share these results with you and discuss the beautiful wines that won them. After two visits to the Cape in 2018, Tim Atkin is releasing the sixth edition of his famous South Africa Special Report. In it he specifically mentions being tremendously impressed by the white wines delivered across the region, for the 2017 season. (Spoiler alert: Both of the white wines we entered scored above 90!) Tasting 1 980 different wines, it is safe to say that Mr Atkin has come to know and appreciate what South African wines are all about. 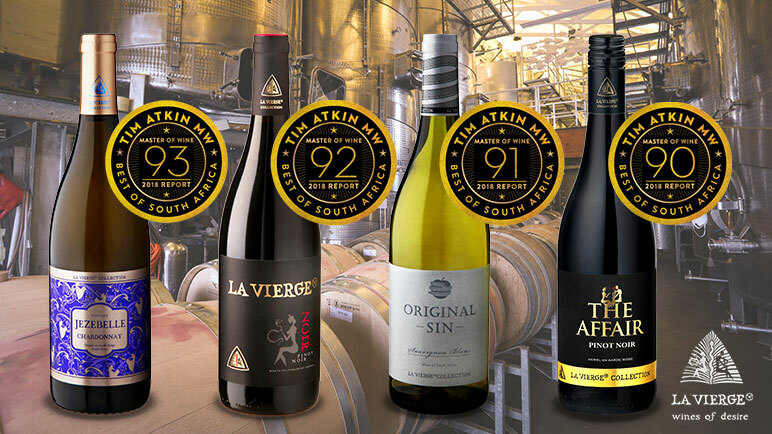 He awarded four of La Vierge’s wines with Medals of Excellence, all of them achieving scores above 90 points. Scores: La Vierge Jezebelle 2017, 93; La Vierge Noir 2015, 92; La Vierge Original Sin 2017, 91; and La Vierge The Affair Pinot Noir 2017, 90. Did you know that wines entered into the IWSC are not only tested organoleptically? A wild guess says you didn’t, because you just Googled “organoleptic”. Basically it means that in addition to being experienced with the senses (taste, smell, etc. ); wines also undergo extensive chemical analysis. The Competition has undergone changes over the years, but one thing still remains the same… The best quality wine and spirit products worldwide still receive the highest level of recognition for their produce. This is why we’re so tremendously proud to have been a part of this year’s event and we celebrate receiving awards for two of our wines. 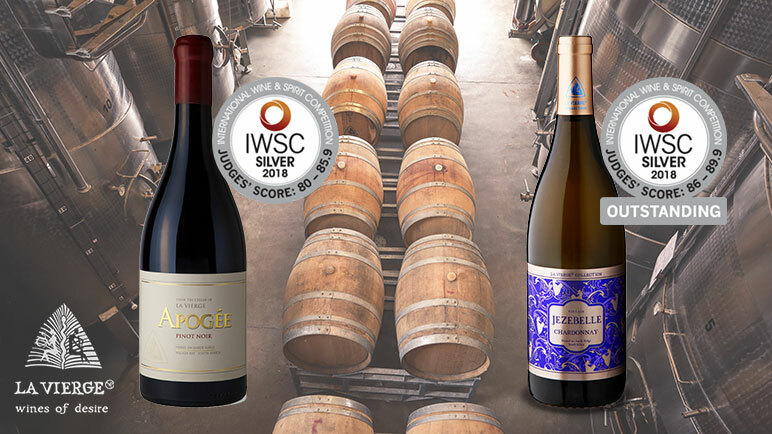 Scores: Apogee Pinot Noir 2015, Silver; and Jezebelle Chardonnary 2017, Silver Outstanding. If, on occasion, you’ve felt that the wine industry is a little too pretentious for your taste, you’ll be happy to hear more about the consumer-judged Vitis Vinifera Awards. The panellists evaluating the wines on offer are not wine masters who can tell, from a blind tasting, which direction the wind blew across the vineyard. But rather these judges are lovers of grape derived products such as wines and spirits… The exact members of the public who will spend their time and hard earned cash only on quality South African wines they really like. And it’s for this reason that we are so excited about the results our wines achieved at this year’s Vitis Vinifera Awards. Because, at the end of the day, we create “wines of desire”… It’s why we have such a passion for wine making… We do it all for the people who drink our wines and enjoy them. 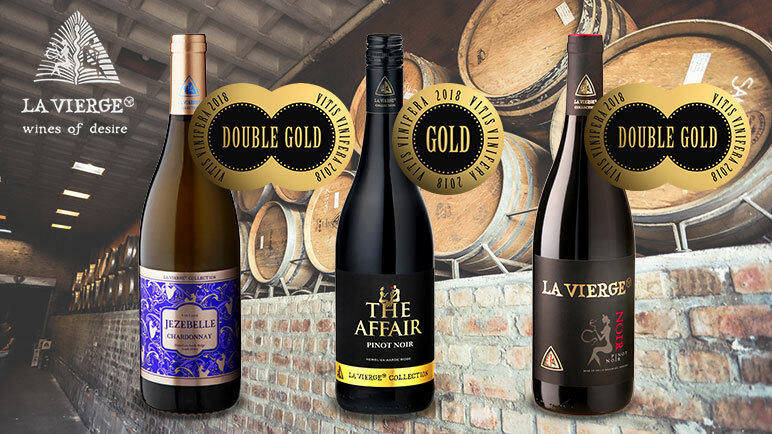 Scores:: La Vierge Jezebelle 2017, Double Gold; La Vierge Noir 2015, Double Gold; and La Vierge The Affair 2017, Gold. If this is your introduction to La Vierge wines and you’ve never visited our tasting room, we almost envy you… You get to go through the distinct pleasure of experiencing our awardwinning wines for the first time. Come take in the ambience of our tasting room. Stock up on your favourites via the La Vierge online wine shop or conveniently purchase wine on TakeAlot and have it delivered to your doorstep. Whatever your tastes, we’re sure we have a wine that would thrill your taste buds. So come raise a glass and celebrate our award success with the La Vierge team!